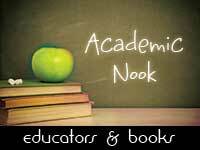 We are very happy to welcome our dearest blogging friend, Linda Baie, our featured Academic in Behind the Books. Since our current bimonthly theme celebrates all things CYBILS-related, we are happy that Linda has agreed to share with us a few of her own reflections as a Cybils 2nd Round Judge for the Poetry Category. A warm welcome once again, Linda! Read on to know more about the Reflections of a Cybils Poetry Judge. 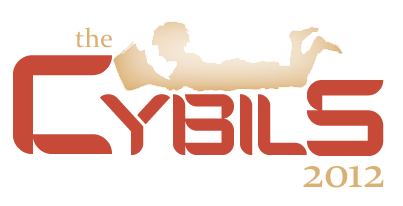 I don’t remember when I discovered what the Cybils awards are, but I do know that I was excited to see what many educators, writers and librarians who blog thought was good literature. 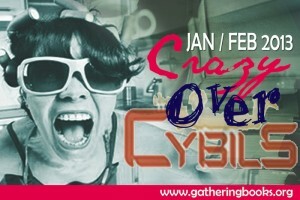 Probably I began to notice the term when I started blogging a few years ago and reading others’ blogs. They referred to books winning the Cybils award again and again. Poetry this year has been a wonderful experience. Not only has it given me a chance to write poetry, I have also been able to read and listen to a lot of poetry as well. I liked having a group to read my poems to, and getting feedback, as well as giving it. Some of the poems I have discovered this year have been amazing, and have made me think about poetry in different ways. It is so wonderful how creative and beautiful poetry can be, and how many different types there are. I really enjoyed being part of such a great group, as well as learning about and writing more poetry. I’m sure this love and deep respect for poetry will last all my life. In the fall, I read as many of the nominees as I could find, and tried to predict what the first round judges would choose as the finalists. You can find that first list here. I managed to predict a few correctly! It isn’t easy “judging”. I am used to just enjoying each poem and anthology as it comes, and sharing it with friends and colleagues. I no longer have a classroom, but work as a literacy coach at my school. My reading repertoire is widening to include literature for younger students too, so reading blog posts and the poetry nominees has enriched my knowledge of excellent choices and authors available, both past and present. I received a ‘top-secret’ e-mail the day before the finalists were announced, and learned who had been chosen a day ahead. This was a thrill I hadn’t anticipated, that I knew who before others. I owned some and ordered the others from the library, readying to read again, or read for the first time, those seven finalists. (You can find the finalists in all categories here!) I have read, I have made notes; I have looked at what others think about children’s poetry, and created my own definition. It’s been a delight to prepare, to discover new ways to look and listen that I didn’t think of before. Poetry touches hearts, but since each of us judges comes with different backgrounds and experiences, I imagine that each of us will come with varied feelings about different books and/or poems. Our job is to mesh the feelings with the craft, and choose just one to win the award. What a challenge. I am still reading poetry anthologies for children, looking at ones in our library, finding that colleagues have some to show me. 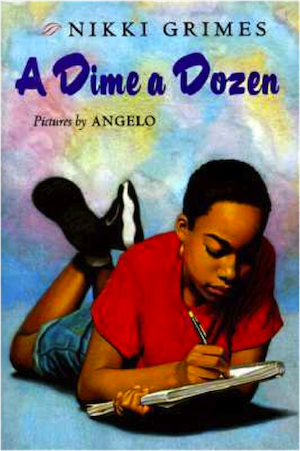 I just discovered A Dime A Dozen by Nikki Grimes, published in 1998. It’s realistic poetry, telling of experiences of daily life in families, seeming autobiographical because there are some poems included about writing in it.